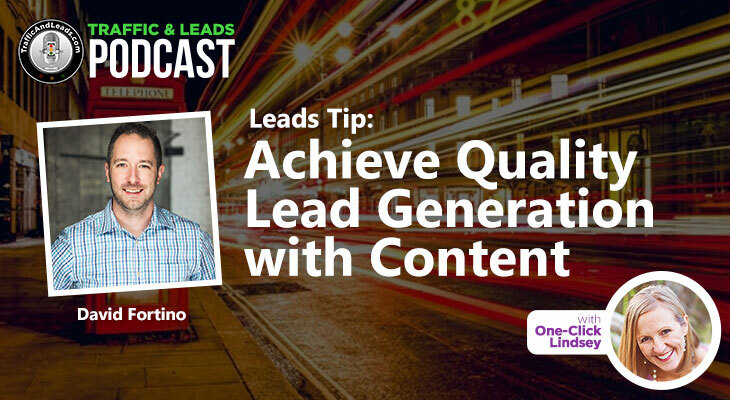 August 8, 2016 /Traffic and Leads Podcast/ - One-Click Lindsey, host of the Traffic and Leads Podcast, interviewed David Fortino, SVP of Audience and Product at NetLine Corporation, to learn why it's important to attach forms to your company's content and how to find the distribution channels. The cost per lead for your business and exposure. Why it is very important to treat your clients with respect and be patient. Why you need to give a consumer time after downloading content from you. Why it is important to nurture your email list. Listen to the interview now at: Traffic and Leads Podcast. One-Click Lindsey, the founder & host of the Traffic and Leads Podcast, a weekly show where I interview top professionals that know how to generate traffic and leads for your small business – inspiring and educating you to take the steps necessary to generate the most important two things for your small business. Want to know more about me, One-Click Lindsey, go to www.oneclicklindsey.com.